Adapting Beverly Lewis’ popular novel The Redemption of Sarah Cain,Â director Michael Landon Jr. has created another installation in the Fox Faith series of overwehlmingly sappy and underwhelmingly produced “Family Dramas.” Centering around the titular character, the aptly named Sarah Cain (get it? remember: subtlety is the enemy), aÂ Portland newspaper columnistÂ who finds herself in the highly unlikely and unexpected situation of adopting five Amish children after her sister dies. As Sarah,Â relative newcomer Lisa Pepper, does her best to work with Brian Bird’s syrupy script, but for the most part she ends up staring doe-eyed at whoever she may be speaking to at the moment. From the opening scenes,Â LandonÂ is sure toÂ remind his audienceÂ that this is the type of film where complicated things are simplified and simple things are simplified even further. Sarah’s work as a columnist for a Portland paper somehow affords her a fairly lavish lifestyle (a notionÂ many journalists would probably take issue with), though she’s barely pushing 30 and is only published in two newspapers. After getting the news from her boss (a decent Elliott Gould) that her column may get cut if it doesn’t improve soon, Sarah heads to lunch with her long-time boyfriend Bryan (English actor Tom Tate) where she gets the news that her Amish sister has passed away. Though on the verge of asking her to marry him, Bryan doesn’t even consider going with Sarah to her sister’s funeral, instead settling for kissing her goodbye (on the cheek) and telling her to call when she gets back. This is the type of simplification that may make for “family-friendly” viewing, but also makes for unrealistic storytelling. At the funeral in Lancaster County, Sarah discovers that she is the only surviving relative of her sister’s five children (their father having been killed years ago when “a truck hit his buggy”). Overnight she is forced to make the decision to raise the children herself or see them separated and sent to foster homes. Of course, she opts to take care of them herself, and again the simplicty of moving five new people into her single-person apartment is hardly addressed. As SarahÂ gains readers writingÂ about the children in her newspaper columns,Â her nieces and nephewsÂ begin to expose themselves to the strangely modernÂ culture of the city. Etcetera. Etcetera. Though the first two-thirds of the film are overplayed and blatantly preachy, the final act sets a new precendent for overt sentimentalism. As the entire cast takes turns sobbing and confessing to each other for the last 40 minutes, audiences are likely to feel more thanÂ a little manipulated as the tears fall and theÂ plodding score kicks into overdrive. Though director Michael LandonÂ Jr. and writerÂ Brian Bird areÂ listed as “Award-Winning Producers,” the only award they’ve claimed is the Character and Morality in Entertainment Award or CAMIE, which helps to explain their lack of skill in executing a tale as intense as this one. The standard Fox Faith fan base will likely find this movie palatable as it lacks any swear words or violence; but a lack of violence doesn’t make up for a lack of depth or viewability. ThoughÂ a decidedlyÂ Christian theme is always riding under the surface, even the most faithful will note that the overall message is a bit too heavy-handed to be successful. 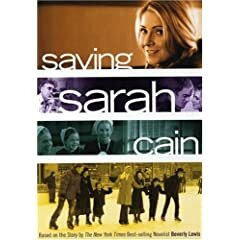 4 users commented in " DVD Review: Saving Sarah Cain "
I thought this was a wonderful film. Full of important life lessons. Zach is pompous git who is quite obviously far to faux-sophisticated for this “banal” piece. Perhaps bloggernews should find a reviewer who isn’t so obviously superior to the material. Saving Sarah Cain. Incredibly stupid and inept movie on so many levels its not worth the time to comment. The people who made this one should be barred from the industry.